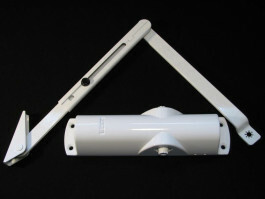 The overhead door closer is suitable for 1-leaf doors up to a 950 mm leaf width. he overhead door closer is suitable for 1-leaf doors up to a 950 mm leaf width. The closing speed and hydraulic latching action can be adjusted. Variable closing force in two stages by simply turning the bearing block for the link arm around: Closing force of type `weak´ (size 2 according to EN 1154) for door leaf widths of up to 850 mm and closing force of type `strong´ (size 3 according to EN 1154) for door leaf widths of up to 950 mm. The door closer is optionally available with a mounting plate and is suitable for both right and left single-action doors without conversion.